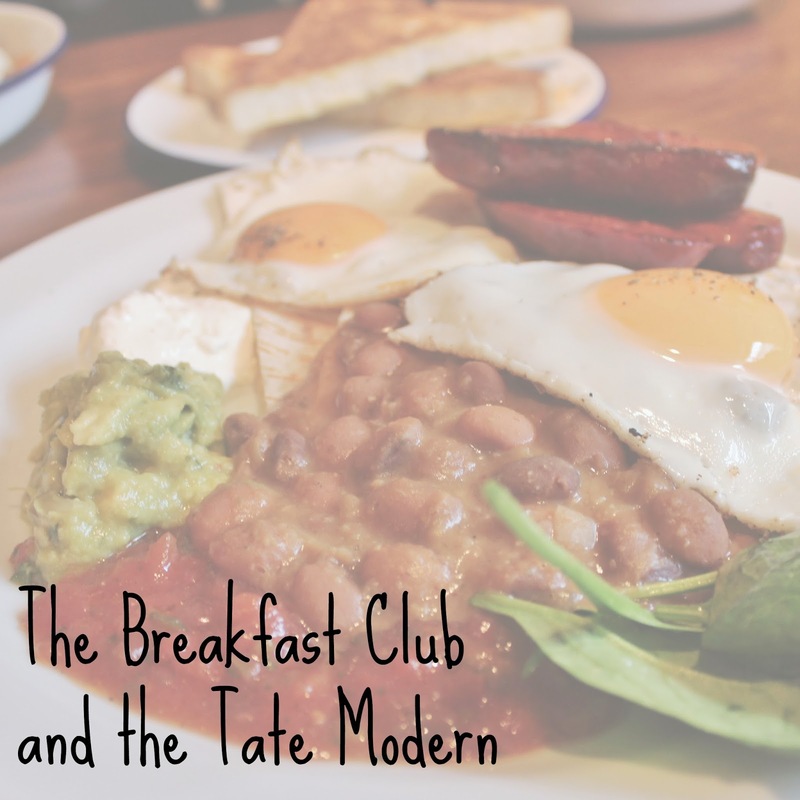 We woke up surprisingly hungry after our day at the BBC Good Food Cakes and Bakes Show so where else to head but The Breakfast Club? I had heard so many good things about it, and seen so many pictures of the queues outside them that I couldn't possibly leave London without having queued up myself. So queue up we did, and we were soon joined by one of my sister's best mates, Louisa, who is now living and working in London. Jealous! We only had a 20 minute wait, and as it was lovely, sunny and we were having a good catch up with Lou, it went by really quickly. Deciding what to choose took us a fair while, as so many of the things on the menu sound amazing, and I think my eyes were definitely bigger than my belly! We opted to share a pitcher of Mango Go smoothie, which consisted of mango, strawberry and orange juice, and was really good, even if it was a bit thick to pour into the glasses! We also shared a pitcher of orange juice, which was freshly squeezed, and oh so good. Louisa chose the bacon and banana french toast, which was apparently good. The whole combination of sweet banana with savoury bacon just doesn't sit quite right with me, but I have issues with mixing sweet and savoury in the same dish anyway - it's wrong on many levels! Nat chose the chorizo hash browns, which looked really good. She also got a side of french toast, but we had to share that as she got too full - what a shame! They were all small fry in comparison with my huevos rancheros - Fried eggs, tortilla with melted cheddar, refried beans, chorizo, salsa, sour cream and guacamole. Yep, I was slowly turning into an avocado during the weekend. The flavours complemented each other beautifully, the eggs were perfectly runny, the chorizo sausage was perfectly spicy, and there was so much tortilla with melted cheddar that I had enough to mop my plate up at the end. I was that person. This is one of the best breakfasts I have ever eaten, and I still can't decide whether it beats my breakfast at Bills from the day before. The staff at the Breakfast Club were really accommodating and allowed us to sit and eat for as long as we wanted to, without rushing us on, as we expected when there was a queue outside. When we left, we decided to head to the Tate Modern, as neither myself or Nat had ever been before and we wanted to see what all the hype was about. On the way we stumbled across this really cool house sandwiched between some tall office blocks. Originally I thought it was like the Up house, but on close inspection it was discovered that it was an art installation for Merge Festival. The artist, Alex Chinneck, has made the whole house out of wax, and is melting it over 30 days until the roof will be left in a puddle of red wax. It looks so creepy and eerily elegant. I love London, because you are always stumbling across really cool things without even trying! And then totally questioned what art even is. That is a grey rectangle. It is classed as art. It is probably the scientist in me saying this, but that is not art. That is a colour. We all got a bit confused, Nat and Louisa less so than I did, I stopped taking art at 13, so I am very uneducated in the matters of interpreting art. Still, at least I have been to the Tate now, so it is something else ticked off my London bucket list. I hope you have enjoyed reading about my adventures around London, I should go back more often, it gives me lots to write blog posts about! The food at The Breakfast Club looks amazing, I'm deffo going to check it out when I'm back in London next month! I have the exact same response to some art, my partner's more understanding, although we d both question the level of effort sometimes. I love the Tate Modern! Looks like lots of fun, the house made of wax is amazing! I'd love to see it all melted too! You were in my neck of the woods. I live just 10 mins from Angel. I've never been to The Breakfast Club, but I do love Bills. Haha this was not what I needed to read when I'm hungry! Ever single one of those dishes looks amazing. :o I'm with you about the grey rectangle too - all for simplistic but that's a tad too far! I am so intrigued by The Breakfast Club but I have to question whether it is so hyped up it is almost inevitable to be disappointed? Your food looked lovely though but you're right...Bills is awesome! You have a lovely blog :) thanks for sending me the link. Coincidently I too am waiting for my letter from Hogwarts. Perhaps there is a Royal Mail issue? I also wondered about the Breakfast Club, but I have to say, it did live up to the hype. You should give it a go!